Is your dog suffering from an itchy skin and scratching away frantically? Have you noticed discharge from their ears and too many instances of bloating and other gastrointestinal troubles? If so, there is a likely chance that your pet may be suffering from some kind of a food allergy. Like us, our dogs can have allergic reactions to different kinds of foods. While there is no definite cure for allergies, careful dietary management with a veterinary diet for allergy prevention and containment can help your pet to a considerable extent. Be sure to feed your dog only pet food, whether commercial or homemade, that they can tolerate and which won’t aggravate their allergies. 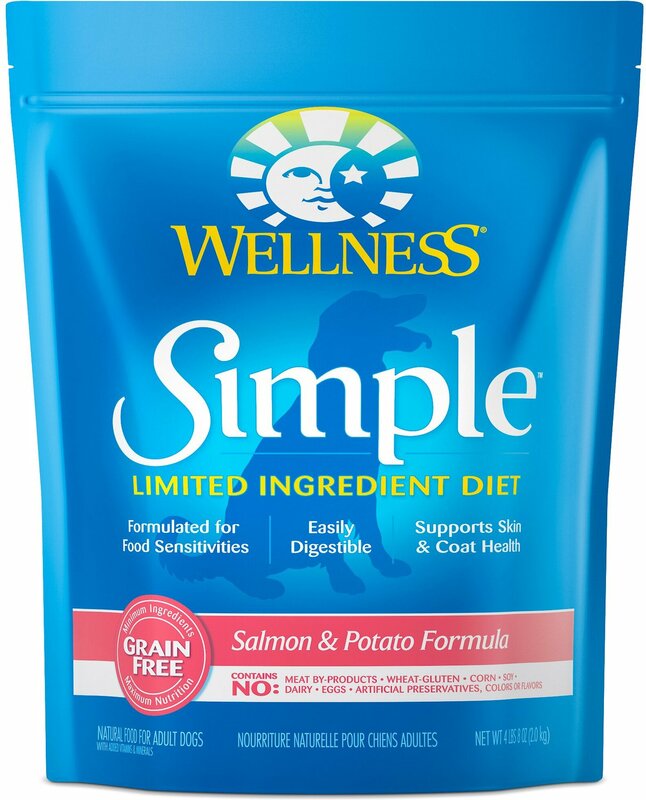 Salmon, potato, tomato pomace, ground rice, canola oil, and vitamin and mineral supplements are the main ingredients in this hypoallergenic dry dog food. There is no meat by-product and no artificial preservatives, flavors, and colors, and it is grain-free. While the food is formulated to tackle allergies, the manufacturer recommends that you introduce the pet food into your pet’s diet gradually, and increase the portions as the dog becomes accustomed to it. After a few weeks on this hypoallergenic dog food, you will most likely notice your pet’s allergies clearing up to a considerable extent. What Does Hypoallergenic Dog Food Contain? What Does Hypoallergenic Dog Food Not Contain? Food allergies in dogs occur when their immune system mistakes a food protein molecule for a threat and goes haywire in an attempt to deal with it, unleashing antibodies to fight off the perceived enemy. This can result in allergic symptoms like severe itching, skin irritations, ear infections, eye infections, diarrhea, bloating, and sneezing. These can be quite distressing for your pet and, if left unchecked, can lead to serious and even fatal health consequences. Pet parents need to take preventive steps from the onset and be extra vigilant about what their dogs eat. Putting your pet on a diet of hypoallergenic dog food or a special veterinary diet of grain free dog food can help. A dog can be perfectly healthy as a puppy and may then develop an allergic reaction to food later in life. In some cases, the opposite may happen. An allergic puppy may shake off its allergies as it grows up and become perfectly normal. There is no exact explanation for it. Some dogs do have a genetic predisposition to developing a food allergy though. These include dog breeds like German Shepherds, Spaniels, Retrievers, Dachshunds, and Lhasa Apsos. In some cases, the dogs may have had their immune systems compromised by malnutrition or an early exposure to antibiotics. Both malnutrition and antibiotics affect the health of the gastrointestinal tract and lead to the immune system’s malfunctioning, which, in turn, causes an allergic reaction in your pet. If your dog has been constantly scratching and showing skin eruptions or any other symptoms, the first thing you need to make sure is that it is a food allergy and not a case of food intolerance. Sometimes it’s easy to mistake one for the other, but there is a definite difference. Food intolerance occurs because of a poor digestive system, and a dog food allergy, as mentioned before, is the immune system’s mistaken over-reaction to a food protein molecule. After doing a skin test and a blood test, your veterinarian should be able to tell you what your pet has, if it is a genetic flaw of this particular dog breed, and recommend a hypoallergenic dog food diet. Whether it is a case of food intolerance or food allergy, you will need to watch what you feed your pet. Meat, vegetables, and grain all contain proteins, and any of these may cause an allergic reaction in dogs. There is no way to foretell which food your pet won’t be able to tolerate. Some dogs may be allergic to only one type of food, while others can be allergic to a range of different foods. The only way you can discover for sure that a specific pet food item is adversely affecting your pet is by putting them on a food elimination diet. In a food elimination diet, you stop feeding your pet the food they have been eating regularly so far, and switch to completely different food items that they have never had before. As the dog’s immune system has never encountered the proteins and carbohydrates in the new foods, there will not be a negative reaction. You then keep your pet on this new diet for at least 10 weeks until they recover health wise, and then you reintroduce the previous foods, usually one after the other, checking how the dog reacts to each. If there is an adverse reaction, you know your dog is allergic to this particular pet food, and you eliminate it from the dog’s diet in the future. Hypoallergenic dog food is specially formulated for dogs with allergies. 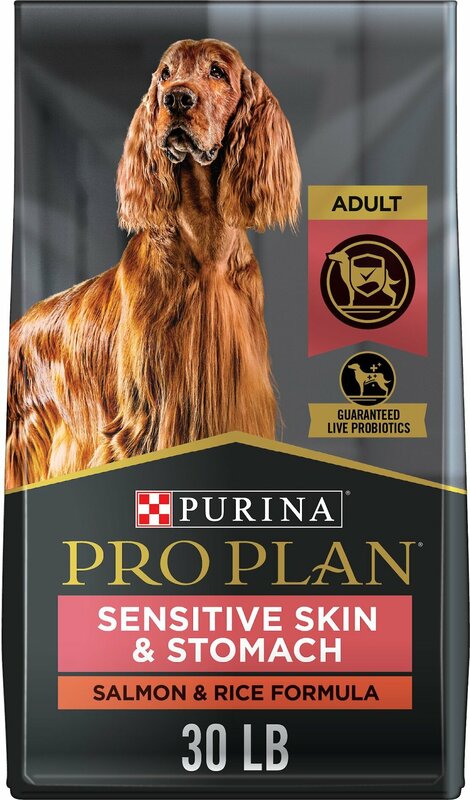 It contains a limited number of protein and carbohydrate ingredients and the ingredients are carefully selected to be safe for allergic dogs and to contain a high level of nutrients. Eating such grain-free food lowers the risk of getting allergic reactions or developing new ones. Also, the protein molecules in these foods have been rendered into very small pieces, and, due to their tiny sizes, they are given a pass by the intestine’s immune guard cells and the body is able to digest them without any trouble. This is the reason veterinarians recommend a hypoallergenic food diet to resolve allergy-related health issues. Of course, even with a veterinary diet, you may still need to keep changing the menu and point your dog towards a diet with different hypoallergenic foods. This is necessary to keep your pet from developing a sensitivity to any one of them. Hypoallergenic dog food contains natural and nutritious ingredients like beef, venison, lamb, duck, fish, squash, pumpkin, sweet potato, potato, carrot, beet, kelp, celery, canola oil, fish oil, fatty acid, vitamins, and minerals. Each food company has different food recipes and food combinations for dry dog food as well as wet dog food, but the basic premise of the hypoallergenic diet is that it is safe for sensitive digestive systems and will not cause your pet to break out into an allergic reaction. Hypoallergenic dog food does not contain any artificial food products and any artificial colors, flavors, and preservatives. They also don’t contain foods that are likely to trigger an adverse reaction in allergy-prone pets. These can include grains, dairy products, poultry products, soy products, beef, lamb, rabbit, pork, and fish. This may sound surprising, given that many pet foods that are marketed for allergic pets do contain some of these ingredients. Not all dogs are affected to the same degree, or may not suffer from allergies at all after consuming the same ingredients. So it is possible to have some hypoallergenic dog foods with some of these ingredients. In certain severe cases of food allergies, your veterinarian may prescribe a special veterinary diet for your pet. Royal Canin is one of the best-known brands of prescription dog food and has a special diet to treat a variety of canine health issues. Royal Canin may be more expensive than other brands, but is well worth your pet’s health. 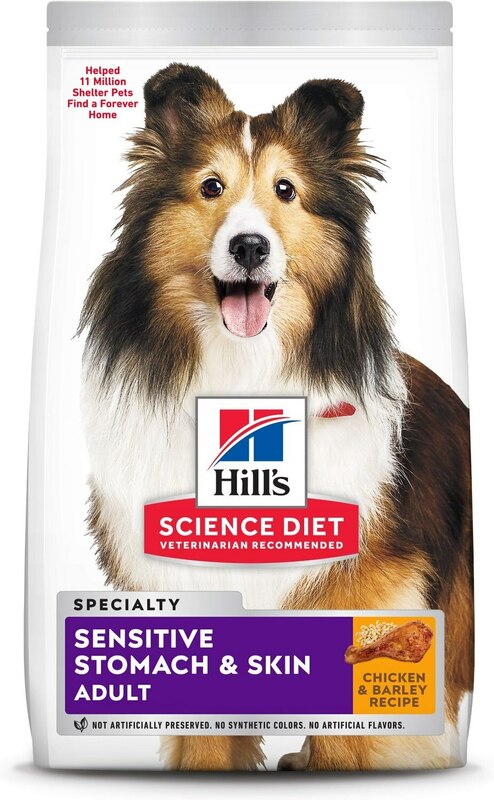 Many veterinary clinics usually sell such hypoallergenic veterinary diet brands to their clients or write you a prescription to buy it from the company or the company’s special outlet. You may not be able to buy a veterinary diet brand of dog food elsewhere without a veterinarian’s prescription slip. If you’ve noticed your pet incessantly licking and biting their paws, it may be a yeast infection arising from a food allergy. 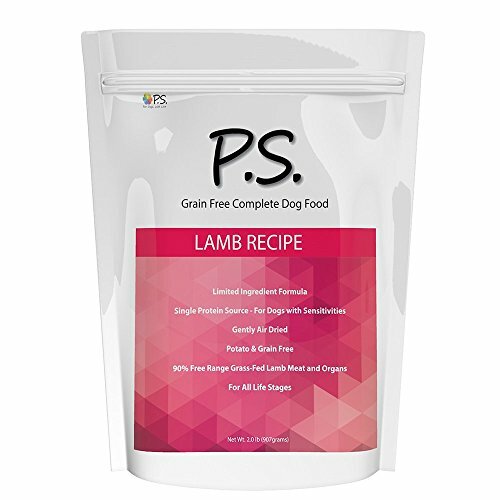 PS for dogs is a limited ingredient, prescription dry dog food that has been formulated to tackle such infections as well as skin disorders that cause itching, sores, and bad smells. The main ingredients include lamb, pumpkin, parsley, rosemary, vitamins, and minerals like zinc proteinate and iron proteinate. Several pet parents report that their pets have stopped itching and scratching and their health condition has improved in a matter of weeks after being put on this veterinary diet. You will need a veterinarian’s prescription to buy Royal Canin HP hypoallergenic dog food. 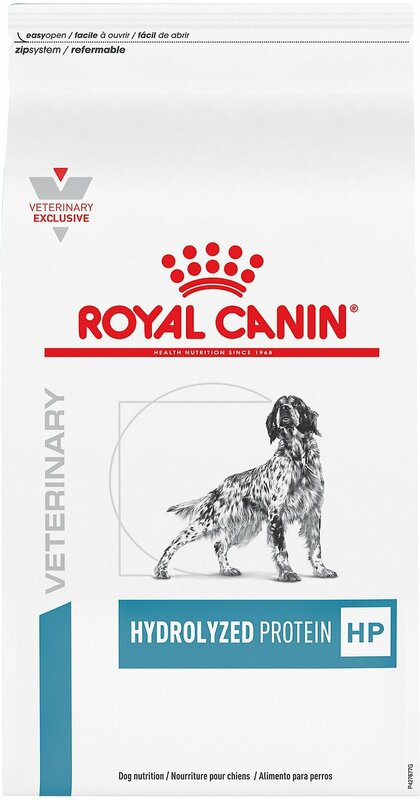 This pack of Royal Canin HP contains rice, hydrolyzed soy protein, omega-3 fatty acid, and minerals, and is especially recommended for dogs with sensitive stomachs and those that are prone to skin problems. 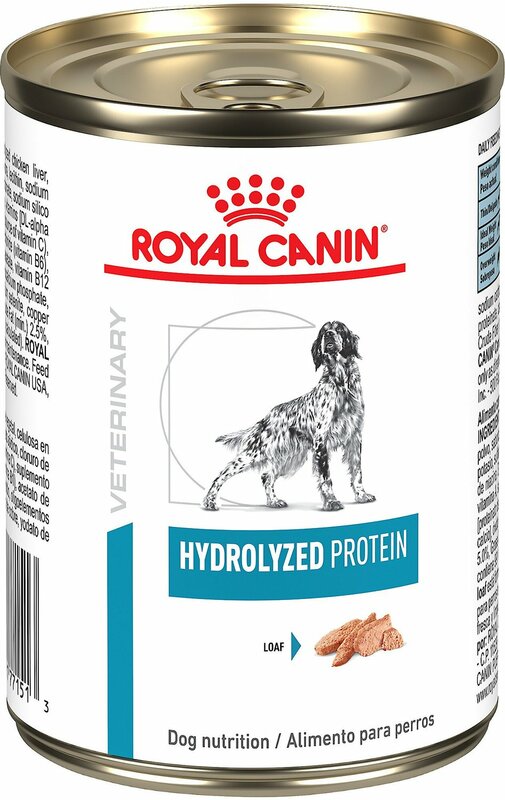 This Royal Canin can contains hydrolyzed soy protein, fatty acid, vitamins, and antioxidants, and veterinarians recommend it for dogs with skin problems. Some pet parents report that the taste of the Royal Canin wet food didn’t appeal to their pets, but that it had the desired positive effect on their pet’s health. 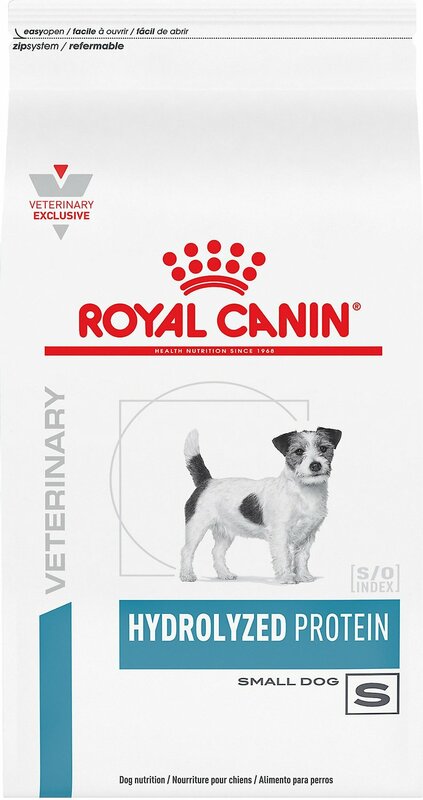 Veterinarians recommend this pack of Royal Canin for small breed dogs that suffer from kidney problems. Some pet parents have reported that eating Royal Canin has helped their pets urinate better and has also improved their dog’s dental health. The Royal Canin ingredients include hydrolyzed soy protein and omega-3 fatty acids. Looking for treats for your allergic pet? 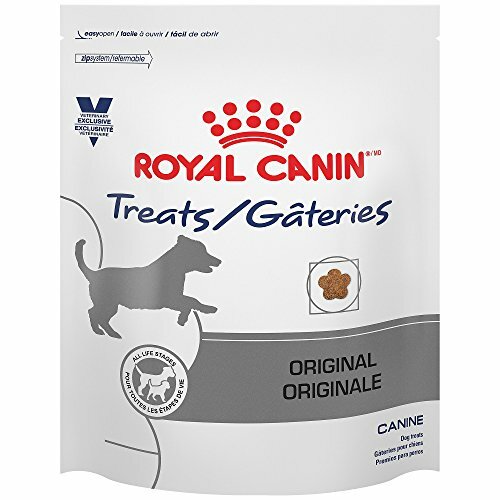 These small-sized Royal Canin dog treats have low calories, high nutritional value, and are good for getting rid of tartar deposits in your dog’s teeth. Eating these Royal Canin treats will also help clear any skin conditions your dog may have. 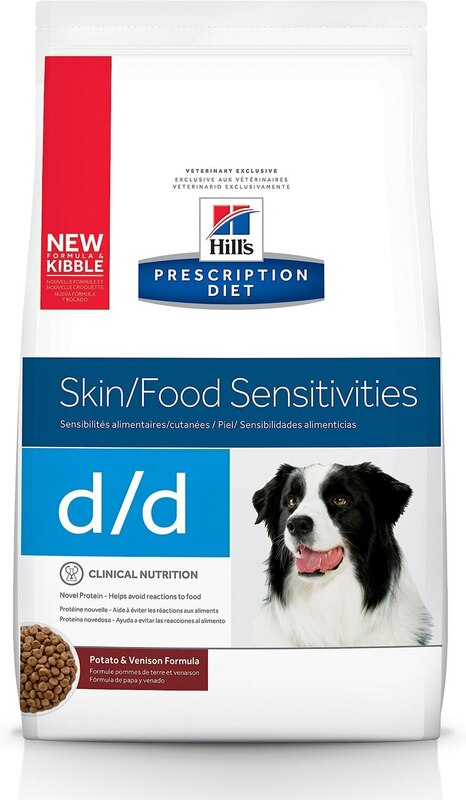 If you’ve been despairing over what to feed your food-sensitive dogs in order to put a stop to their skin eruptions and digestive disorders, you might try this specially formulated dry dog food diet. It contains venison, potato, and fish oil as the main ingredients, and is recommended for boosting the canine immune system and treating allergies. Some pet parents have found an improvement in their pet’s allergic condition in a matter of weeks. 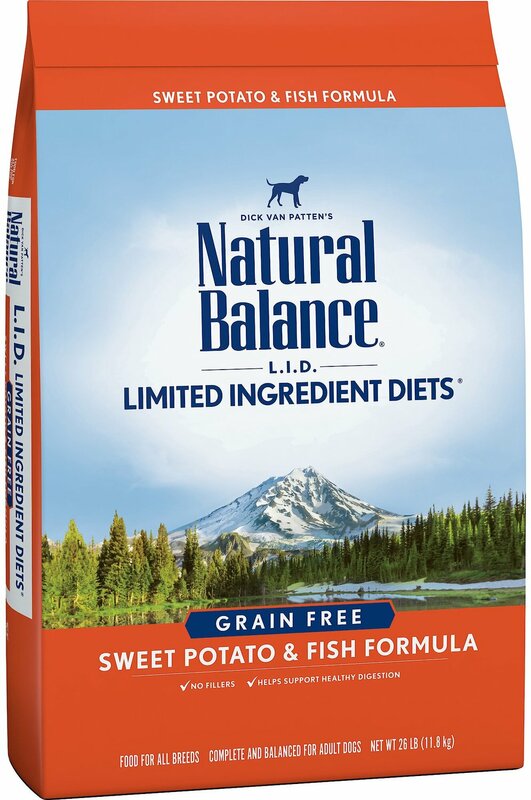 According to the manufacturer, this is a vet-recommended, completely balanced diet that will boost the immune system, and benefit dogs with sensitive stomachs and skin issues and clear up their allergies. The dry dog food is made with high-quality chicken meal, rice, barley, protein, beet, carrots, peas, apples, oats, fish oil, and vitamins. Some pet parents with highly allergic dogs have reported great success with this veterinary diet. Unlike prescription diet food, which you generally need to a prescription from your veterinarian, you can buy limited ingredient foods at a regular pet food store or grocery store. 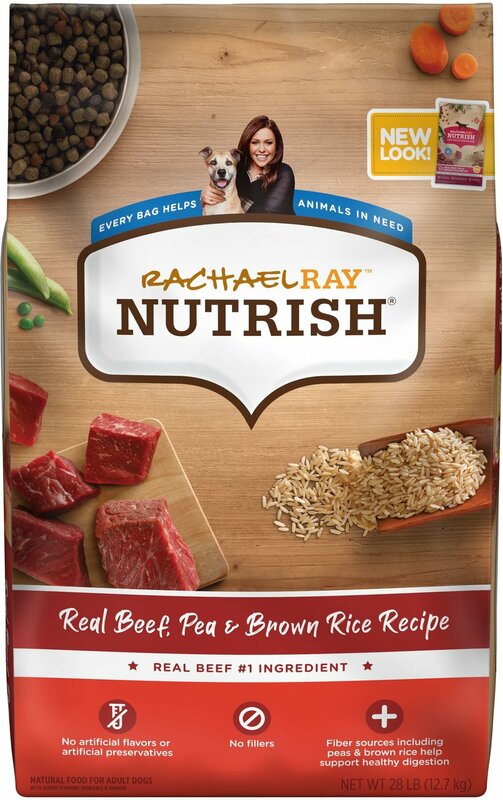 This type of dog food brand contains only one or two main ingredients and these are selected for their easily digestible quality, nutrient value, and their relatively low risk of causing allergies. This is usually grain-free dog food. 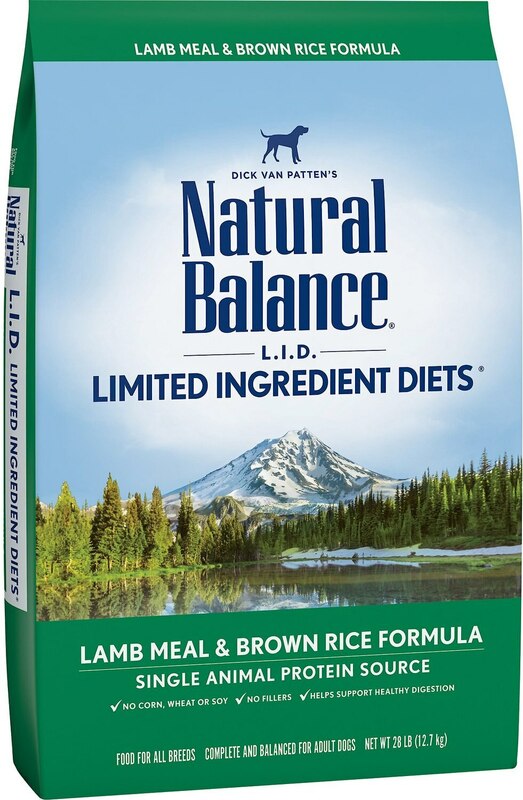 Containing brown rice and lamb, this limited ingredient, grain-free, dry dog food is recommended for dogs that need to avoid poultry products. There have been reports of dogs developing a sensitivity to lamb though, so you should start your dog on this gradually and see how it goes. 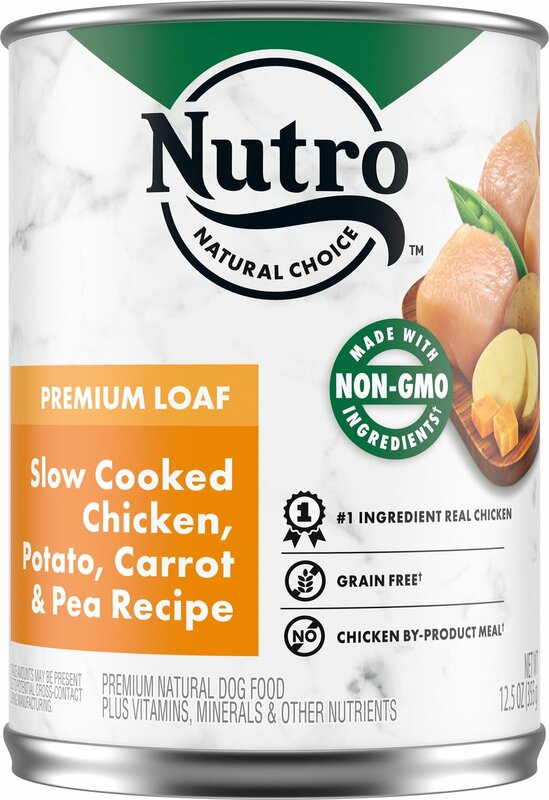 Many pet parents seem to have had a positive experience with feeding this hypoallergenic dog food to their pets, and the pets seem to like it too. 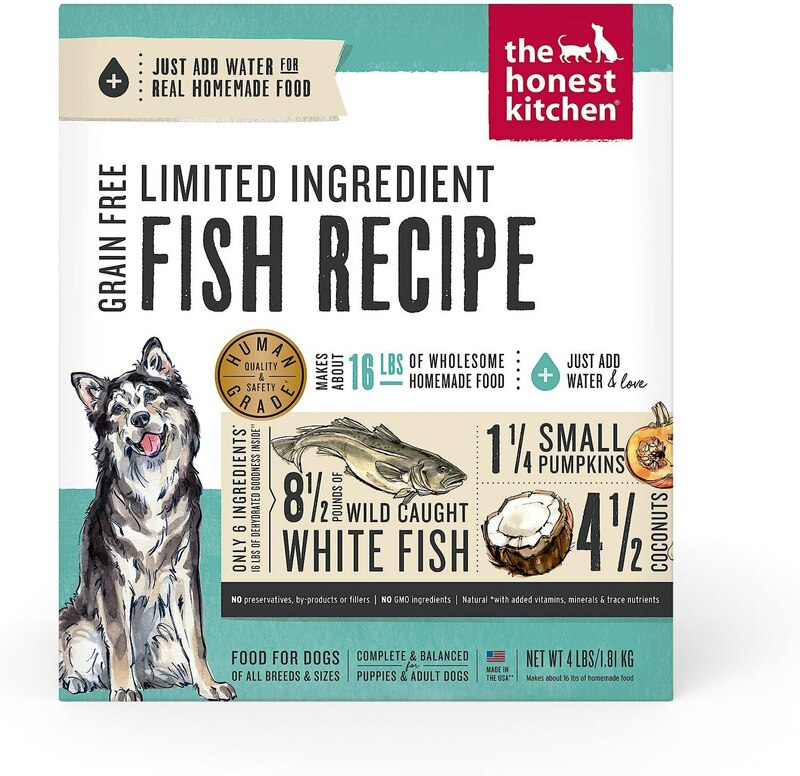 The limited ingredients in this wet dog food include sweet potato and fish, and no grains, artificial preservatives, colors, or flavors. This diet is recommended for puppies as well as for older dogs and will help to keep your dog’s digestive system in good order and to keep their skin and coat in prime condition. Puppies and older dogs will thrive on this limited ingredient food diet made from pollock, coconut, peas, pumpkin, spinach, celery, vitamins, and minerals. The food comes in dehydrated form and you will need to add warm water to it and wait a few minutes for it to expand before serving it to your pet. You can also add this food to a home-cooked meal for your pet. It does not include grains, animal by-products, and preservatives. 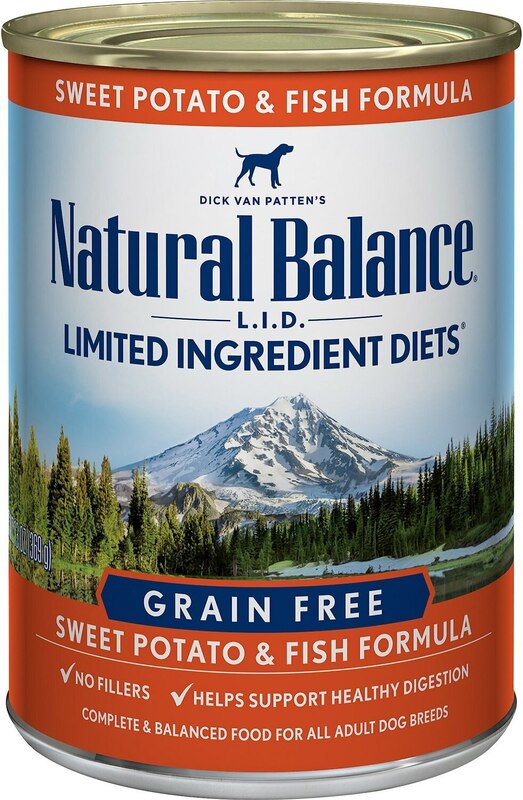 Dogs will love the nutritious combination of sweet potato and fish oil. It is also excellent for their skin and digestion. Pet parents with allergic dogs have reported positive results after putting their dogs on this dry dog food diet for a few weeks. As it is a complete, balanced diet, you won’t need to add vitamin supplements. The lack of artificial preservatives, colors, flavors, and fillers makes this a healthy choice for your pet. 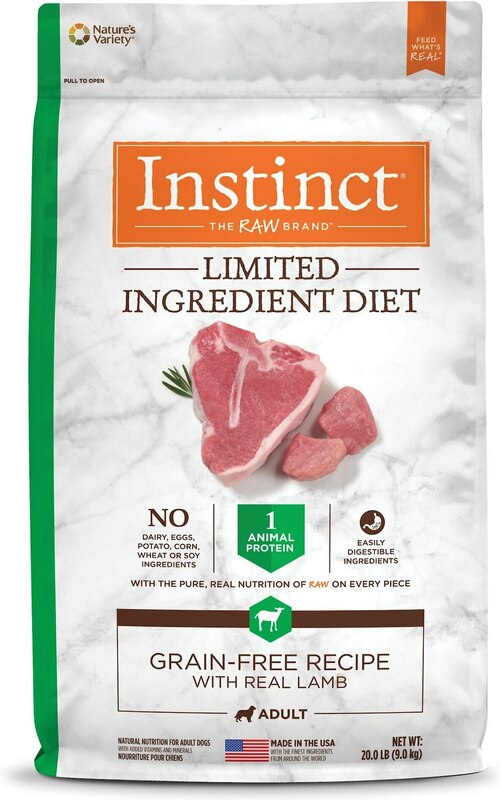 The main ingredients of this dry dog food include lamb, peas, coconut oil, canola oil, manganese proteinate, vitamins, and the food does not contain grain, poultry products, or artificial preservatives. It is a good choice for dogs with disturbed digestive systems. Pet parents have reported normal bowel movements, shinier coats, and more energetic activities after feeding this food. Many customers have reported an excellent experience with this food. Dogs love the small-sized, tasty kibbles, and dogs with allergies have had their symptoms cleared up and remain in good health. The grain-free, dry dog food contains beef as the main ingredient, vitamins and minerals, and natural prebiotics to aid the digestive process. There are no animal by-products, fillers, artificial preservatives or flavors. Made with salmon, oatmeal, rice, barley, canola oil, fish oil, zinc, and prebiotic fiber, this dry dog food is formulated for dogs with sensitive stomachs and skin. The manufacturer claims it is also good for your pet’s joints and will help maintain a healthy, shiny coat. Some pet owners report that their pets have smaller stools as there are no fillers in this grain-free food. There are no artificial colors, flavors or preservatives. 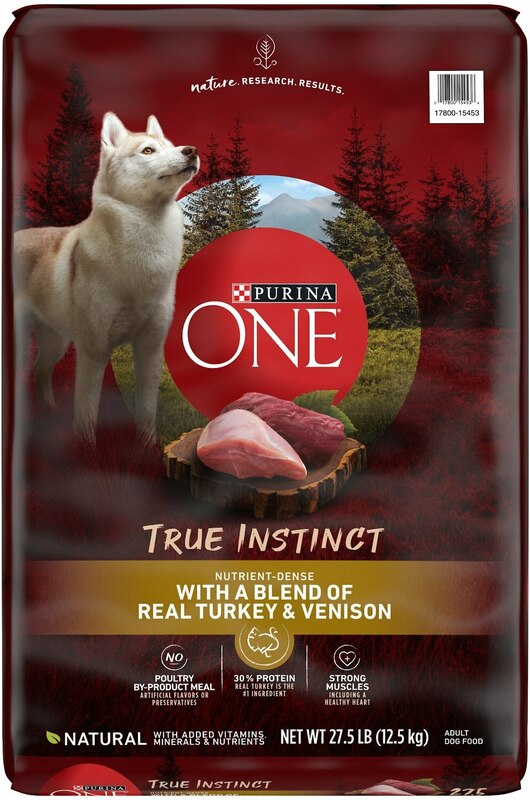 Purina ONE SmartBlend is made from turkey, venison beef fat, chicken meal, whole grain, vitamins, and minerals. Pet parents note that they have no trouble getting finicky eater to gobble up these kibbles, and the health results have also been amazing. As with all foods for sensitive dogs, it’s best to introduce this dry dog food gradually and see how they react to it. Here’s a change from the regular dry food. Nutro wet dog food is a specially formulated diet for pets with allergies. It is made from chicken, oatmeal, rice, dried egg, brewers dried yeast, vitamins, and minerals. This combination is easy to digest and your dog will find it delicious too. You can even mix it with dry dog food. 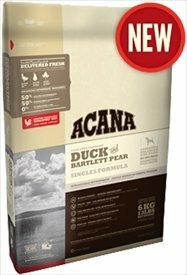 This dry dog food is made from pear, peas, turnip greens, carrots, squash, spinach, and duck. It does not include potatoes, grains, and artificial preservatives. Many pet parents have observed a definite relief from allergies after putting their dogs on this diet, and the dogs seem to love the taste of the food as well. Some pet parents prefer to feed their dogs home-cooked food. Home-cooked food has the benefit of fresher ingredients, higher nutritional value, and no risk of artificial preservatives, colors, and flavors. As a pet owner, if you choose to do this, you need to make sure that you are feeding your pet the right amount of nutrients. You should also rotate the diet and include a variety of different food items, so that there is a relatively lower chance of their aggravating existing allergies or developing new ones. Managing the dietary requirements of an allergic pet can be a difficult and frustrating task, but it can be done. Pet parents make a note of what diet their dog breed can or can’t tolerate, and keep track of what they feed their pets. Consider following a strict veterinary diet, and be vigilant about preventing your pet from grazing on any forbidden food items. With a regular and rotating diet of hypoallergenic dog food, your pet will overcome the risk of a food allergy, will thrive and will have an improved quality of life.